Valentine’s Day is just around the corner and if you are looking for something special to do with your loved one, and they happen to enjoy trains as well, then we have the perfect list for you. Below is our current list of Valentines Day trains. 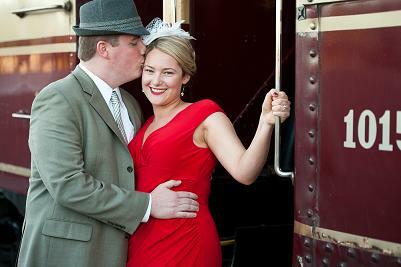 These railroads offer something extra special for Valentines Day in addition to the romance of riding the rails. Remember, these trips are usually limited seating and often sell out in advance so click through and get your seats booked now. If you know of a Valentines Day run we don’t, please let us know and we’ll get it on the list. We do update the list often, so check back. if you have a train related valentines story, please, share it with us! Thanks for the heads up. Would you call this an excursion or a Valentines Day Train? I have a separate list for trips that are doing special stuff for Valentines and want to get the excursion listed in the right place. Location: The Dunbar Parks & Recreation Community Center. The show will feature many operating model railroad layouts including The Cincinnati Bricks Lego Train Set, and the new Exhibit, “Riding the Rails Connecting West Virginia” along with some other collections of railroad memorabilia. There will also be hands on Geo trax for children of all ages. The event will also have Thomas the Tank Engine merchandise and collectibles for sale and food items for sale. This event will feature a hundred or more dealer tables also.The Admission prices for the show is, adults $4.00, children 3-12 $1.00. Show Hours on Friday are from 5pm to 8pm. Saturday hours are 9am to 7pm. Sunday hours are 11am to 4:00pm.